If you have never sat down to review your year, whether it be in business or just life in general... I highly recommend it! It is a moment to reflect... pat yourself on the back for all the awesomeness in your life and learn from the not so awesome moments. By stepping back you understand and learning from those moments and we can apply them to new endeavors and make 2018 the best yet! So in effort to truly see where I have come from (skill & design wise), I felt it would be fun for me (and maybe you) to review some of my Top Builds of 2017. So let's get started. January 2017 was a great month for me. I had two major builds on the books. The Glam Farmhouse Console and the Bold & Beautiful Buffet. They were actually both for the same client. It was so cool to actually go out to her space and help design these pieces with her. I also went to my first maker meet up and met some awesome local makers. The second build I did for her was my favorite for the month... The Bold & Beautiful Buffet. Not only was it my largest build to date, it had a ton of firsts for me. First time working with glass, I made the feet, first time working with moulding, the tongue and groove cabinet doors, and the fun color! February was pretty sweet! I got to build a repeat client a farmhouse dining room table. I also got to team up and build a Chunky 4x4 Console with plans from Jen Woodhouse. (If you want to see more on that build or get the FREE plans..... click here.) But my favorite build in February was a coffee table that I designed myself. It has what I call a WILD top! The planks run the short ways instead of the long ways.... I am rebel! It also has a simple modern design that I think would fit into any space. Plus, it has room for baskets underneath and can be finished to compliment any style. Hoping I can make a hardwood version of this table in 2018, maybe in Knotty Alder for myself??? In March I got to make the 2.0 version of the Wild Coffee Table. This one not only had the wild top but also a shelf underneath. I love how clean this build came out and the finish just popped! I also got to make my first blanket ladder and really hope that I can make more of them in 2018. In April I got to design and build the Wild Wine Bar for BuildSomething.com. I even created plans so that you could make one for yourself. You can find them here. That build was pretty awesome, but my favorite build for April was a mid-century modern rustic-y hairpin coffee table. Can you tell I am not very good at describing my builds yet! Well, this build was just awesome. The top of it was wild and the finish was inspired by the finish on the Wild 2.0 Coffee Table. The base was made from a local welder friend of mine. It wasn't just hairpin legs, but it also had a 1" angle-iron apron underneath. This not only added to the structural support of the table, but added some cool character to the overall look. May was pretty much all about one build, the Mid-Century Modern Dresser. I call it the whale dresser because ever since my friend Ben said he could see a whale eye in the poplar grain, that is all I could see when I look at this build. Thanks Ben! And based on the likes it got on my Instagram I'd say it was one of your favorites as well. It was my first dresser and the first time I used a hardwood! I fell in love with poplar on this build... the grain and the colors!!! This was a fun build because my client pretty much gave me creative freedom to make a mcm dresser with teal in it and this is what we came up with! May was the start of me working with hardwoods using poplar for the drawer fronts of the dresser and then June I jumped right back in with a MAJOR build. An ASH VANITY! Not only would it be my first time working with such a hardwood, it would be the first time making something with drawers and doors and so much more! I was definitely nervous when I started this build, but I just had to keep reminding myself that I had all the skills needed to complete this build.... I just never have had to use them all on the same build. But I am so happy that I pushed myself and allowed myself to do this build. It is a build that definitely gave me confidence to work with ash in the future. But I do still see pictures of this build and smile and say "I built that!". July was a crazy awesome month for me. Looking back at it I don't know how I built these two pieces in the middle of an Arizona summer! I have no A/C in my shop, just a swamp cooler. And if you know anything about swamp coolers they aren't the best in monsoon season! But these two builds are probably my favorites of the whole year!!! So July gets two! The SOLID Ash X-base dining table. This thing was a beast, so heavy! And the Knotty Alder Kitchen Island Base was just so my style. I love the character in the wood and the clean lines. My favorite build in August was for a 5 time repeat client!!! He is awesome. This time he was looking for a standing desk. Just something simple and functional. Why I love this build so much is the colors!!! He isn't very picky on stain colors so I got to try out some new stuff. I went with a charcoal chalk paint on the base and I mixed two Minwax stains to achieve the color on the top. The stain color has since become my favorite. I even used it on the pantry countertop I just completed for my house. In September I had another repeat client build that was my favorite. And all-white farmhouse coffee table. This was no little coffee table. It was 48" square with legs some turned Portsmouth legs from Osborne Wood Products. I actually wrote a tutorial on how to make a farmhouse table and bench with these exact legs. You can find that here! And that table and bench was for the same client! So cool, my clients are AWESOME! Well between getting sick in October and refinishing an oak dining room table and 6 chairs that is all I think I did!!! But now that the hard work is over the transformation turned out amazing. Got rid of the 80's orange oak and gave it a much more modern gray finish. Two projects really stand out to me in November. First one is a dining room table. It has a solid Knotty Alder top with metal legs. This is totally my style and it was my first Knotty Alder top! It got stained classic gray and has a real rustic industrial vibe. 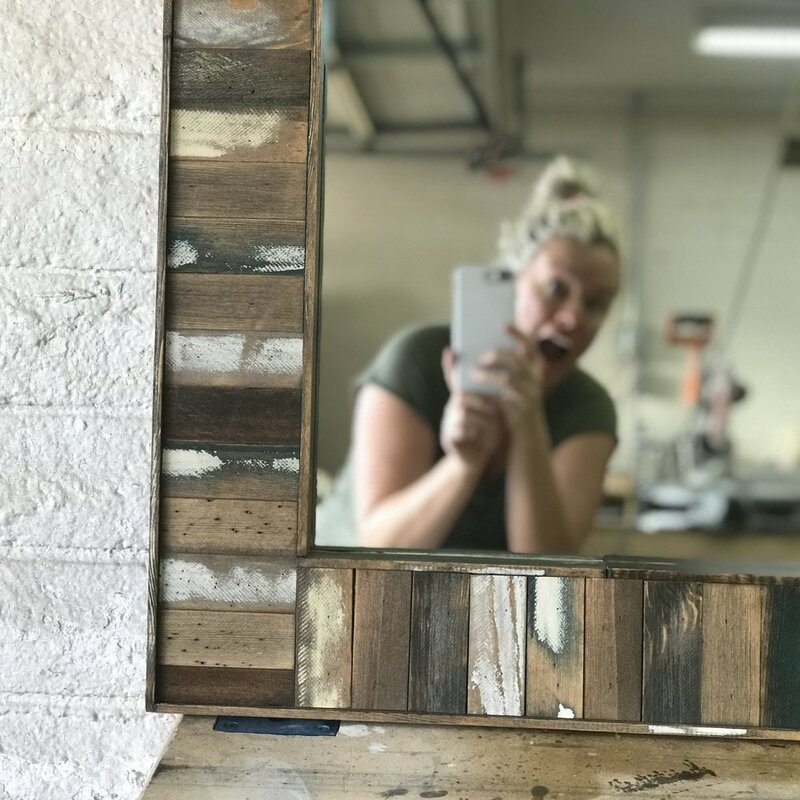 I also got to make a stir stick mirror frame!!! Yes.... it was made from paint stir sticks!!!! If was fun to play with the different paint colors and finishes and come up with such a statement piece. I am sure that won't be the last you will be seeing of a project like that! December was another AWESOME month that was so hard to decide on my favorite that I bring you two once again! The petite shiplap bench is the first and it was inspired by my most popular build in 2016 the Shiplap Hall Tree Bench! It feels so good that I can build pieces that fit perfectly for my customer's homes or their needs. The second and last favorite build for 2017 was the Mega Console. This beast was just under 9 foot long!!! It has shaker style tongue and groove doors, adjustable shelving, tons of storage, and a beautiful rustic knotty alder top! Wow! What a year 2017 was!!! This has been so much fun for me to write this and reflect back on the year and all the AWESOME builds I got to do. If you made it this far on the post... thank you! I can't do what I do without all of YOU! I can't wait to see the builds I get to make in 2018. I already have a few up my sleeve, but the rest with be new collaborations with AWESOME clients!!! I would love for you to shoot me a comment below and let me know which one of my 2017 builds was YOUR favorite. And please as usual, let me know of any topics, builds, diy's, that you would like to see on the blog!